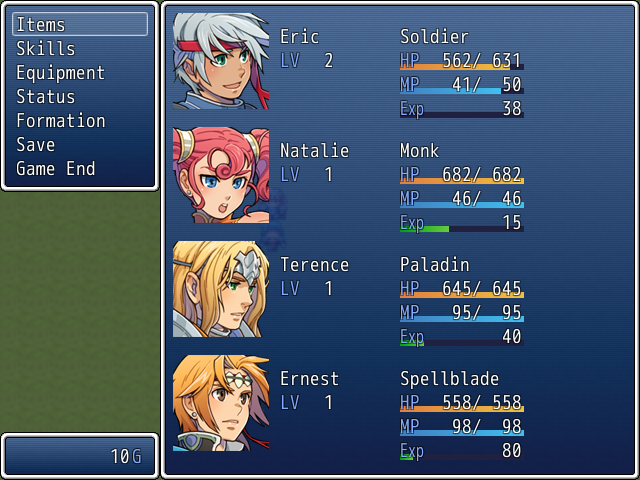 By rbahamut, August 11, 2012 in Completed Scripts/Plugins/etc. #                    gauge back color when empty! 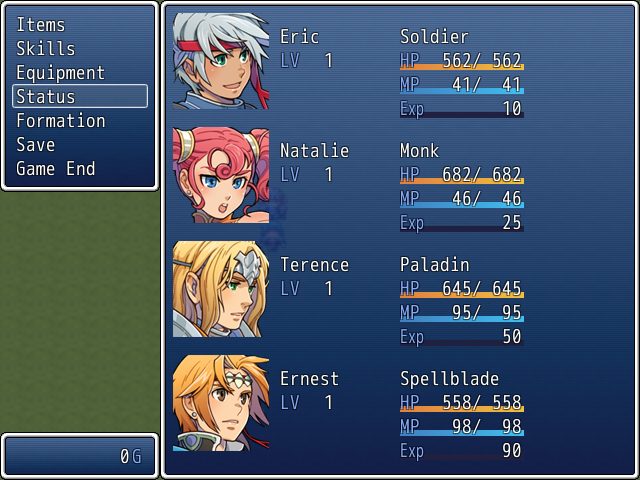 # Changes in v1.1 - No more exp clearing on leveling! # Edit below at own risk! Q: Does the exp I gain carry over into the next level? A: Yes it does!!! Thanks to Xypher, whom had a great catch with the line of code! To my lil bro who was whining about all the other exp gauges not working this way and pushing me to get it out there. BIG thanks to Xypher for figuring out how to not need to wipe exp every level to ensure the exp gauge empties upon leveling! This is my first standalone script and though it is not all that advanced or anything, I would like ppl to be honest about how it is, let me know of any bugs and credit if you plan on usin for commercial game. Works well for me, good job. No need to reset exp every level that way. You like that? lol seriously is my first script I have VERY little programming experience in VB and C++ and never touched RGSS at all so i think i did ok butobviously need to learn moar before im any REAL good. Will it work with yanfly status window? Ok after testing compatability with Yanfly's Status Screen I have found a working method!!!! Script 'EXP Gauges by Rbahamut' line 44: NoMethedError occurred. Tested it in a completely new, blank game. So it's not conflicting with other scripts. I am not getting that error in a fresh new game without extra scripts, nor with other scripts... Im thinking re copy and paste or somethings wrong with ur client. It literally takes the built in exp requirements and just draws a gauge. I will continue to try and reproduce that error in the meantime. I feel like a real tool now, because honest to God I can't recreate the error either. Even though I got it several times yesterday. So, never mind. It was probaly an error on my part. 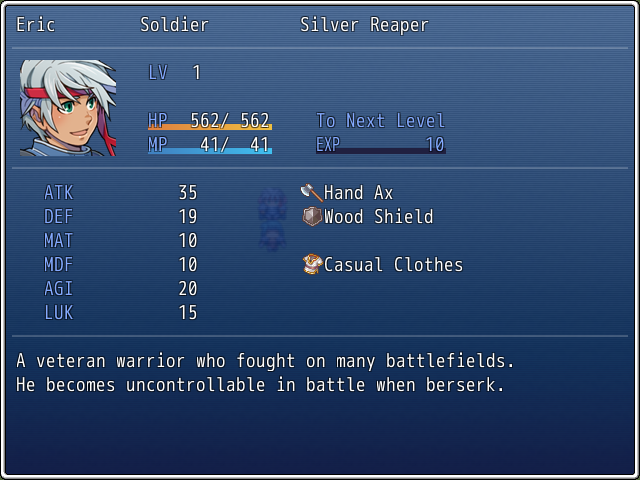 One thing to note is that KMS's gauges are larger, so a third exp bar would not fit on the status menu (perhaps just make it not appear on the status menu since there's already exp bars there.) Either way, good job with the script! Great script I will use it in my game. Sadly it is not compatible with menu scripts. Your script pasted on one line unfortunately. bah I didn't try it in a new game, was being lazy >.< it must be conflicting with another script. It's alright though, nothing wrong with the default. Thanks a ton, this is the exact thing I needed. However, if you don't mind, I made a slight modification to the script to get it to suit my needs a bit better. 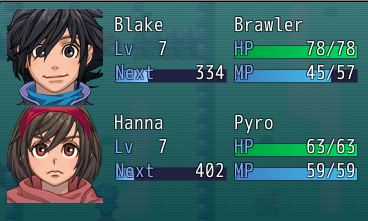 As you can see, I changed the color to match the exp bar on Yanfly's victory script, and moved it over to that empty space under the level. Obviously this won't work for all setups, but I think it looks a bit more space efficient than having three bars stacked on top of each other next to empty space. # gauge back color when empty! Is there any way to change the value on the Exp Bar to read RELATIVE experience and not TOTAL? The bar itself fills as you progress from the level you're currently on to the next but the numerical readout just shows the total experience needed to get to the next level (counting previous levels too). Any chance you can get it to read the amount needed to get to the next level only.